Watch Jamie Elliott win Mark of the Year with this screamer against Port Adelaide in round 14. Watch Jamie Elliott's screamer against Port Adelaide in round 14, 2013. 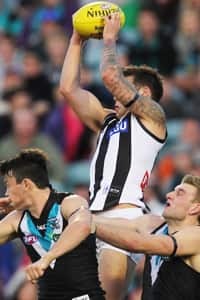 Jamie Elliott won Mark of the Year for this grab over three Port Adelaide defenders during Collingwood's round 14 loss to the Power. Jamie Elliott has joined the likes of Gary Ablett Senior, Shaun Smith and Gary Moorcroft as the winner of the AFL’s Mark of the Year. The 21-year-old has received the honour in recognition of his towering grab against Port Adelaide in round 14. Elliott flew over three Port Adelaide defenders, leaping high, getting the sit and then launching that bit higher to mark before landing on his knees. Elliott’s grab was been nominated by the AFL as one of its best three Marks of the Year and beat the screamers taken by Port Adelaide’s Jay Schulz (against Melbourne in round one) and West Coast’s Nic Naitanui (against North Melbourne in round eight) for the title. The pocket rocket won Mark of the Week on two occasions in 2013. He earned his second nomination in the loss to Gold Coast in round 17 when he soared over Trent McKenzie and landed heavily on his back during the first quarter. A total of 36,381 marks were taken by players during the season, but none were better than Jamie’s screamer against the Power. Elliott becomes the sixth Collingwood player to receive Mark of the Year honours. He follows in the footsteps of the departing Andrew Krakouer who received the award in 2011.